In Roman mythology Bacchus was the god of wine, intoxication, madness and ecstasy, equivalent to the Greek mythological god, Dionysus. In his early years of painting, Caravaggio created two paintings of the mythological being, Young Sick Bacchus and Bacchus. The painting titled Bacchus (c.1596), currently held at the Uffizi Gallery, in Florence, Italy, was painted shortly after Caravaggio entered the house of Cardinal del Monte. The Cardinal had commissioned some 40 paintings from Caravaggio and Bacchus might have been one of them. Many of the paintings Caravaggio created during this time period were of adolescent boys. Bacchus depicts a young teenaged Bacchus reclining on his elbow and draped in a classical robe with a grapevine of leaves crowning his dark hair. There is a marble table in front of him with a basket of overly ripe fruit and a carafe of red wine. His left hand gently holds out a large goblet of red wine. 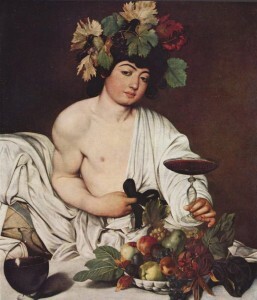 The delicate way in which Bacchus is holding the goblet of wine, has caused many to speculate that Caravaggio used a mirror to help him while he was painting in order to avoid drawing. This would mean that the model actually held the goblet in his right hand. Caravaggio’s early biographer, Giovanni Baglione, had suggested that the artist used mirrors when creating some of his early paintings, which supports the argument. Caravaggio had an eye for detail. In Bacchus we see this in the figure’s dirty fingernails and the details of the overly ripe basket of fruit. Some would argue that these details are symbolic while others that they are simply detail that the artist saw and painted. When Bacchus was restored it was discovered that Caravaggio had painted a tiny reflection of a man, believed to be a self-portrait, on the carafe of wine. It is believed that the model for Bacchus was Caravaggio’s friend, Mario Minniti, who had modeled for several of Caravaggio’s paintings including The Musicians and The Fortune Teller.